The ‘Golden Bridge’ located in Vietnam’s Ba Na Hills is one of the world’s greatest places and an epitome of magnificent architecture. Golden Bridge is a 15-metre long pedestrian bridge designed to connect the cable car stations with the gardens. The bridge has scenic beauty and attracts several tourists. 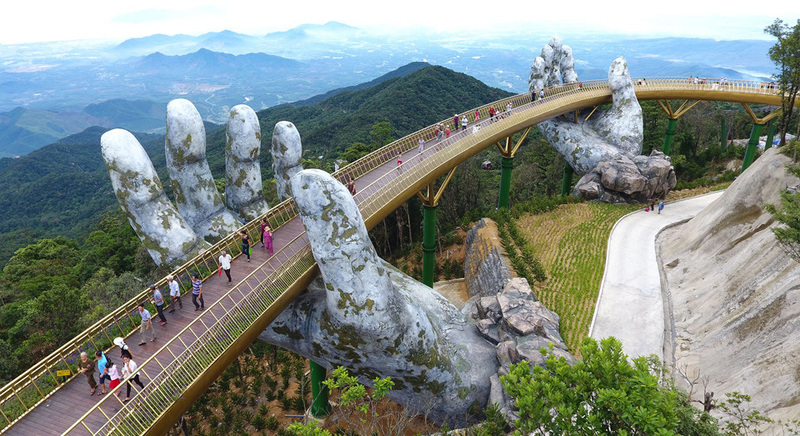 Amidst the beautiful mountains of Vietnam, a colossal pair of giant stone hands lifting the bridge high above the clifftops leaving the people in awe with the engineering. The hands are decorated with cracks and moss to make them look like aged stone ruins. The walkway is 1000 metres above the sea level from where the tourists get an uninterrupted view of the majestic landscape of Vietnam. The bridge opened in June 2018 and was immediately termed as one of the world’s greatest places in 2018. According to the Vietnam National Administration of Tourism, “The Ba Na Hills, a popular getaway for the French during the colonial occupation of Vietnam, received over 2.7 million visitors in 2017. However, the Golden bridge is garnering more tourist attraction ever since it opened.